The Children’s House (Italian “casa dei bambini”) is a pre-school institution in analogy to the kindergarten. 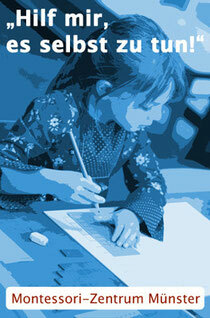 It constitutes the longest tradition (founded in 1907) and the most widespread institution of the Montessori Pedagogy. In Children’s Houses, as basically in all other Montessori institutions, the integration of disabled children and adolescents is considered an important issue. For this, the children’s individual ways of learning and working have turned out to be highly suitable. “Sensorial Materials” as developmental materials (Entwicklungsmaterialien; also called didactic materials) for training (and checking) all senses, at the same time “key to the world”. Impressions that the child has gained unconsciously up to now should be translated into conscious work, i.e. from physically to mentally grasping something up to the basic terms of order and structure (Ordnungs- und Strukturbegriffe)of the spatiotemporal environment: big-small, long-short, loud-quiet, rough-smooth, warm-cold etc. analysis, perfection and enrichment of previously absorbed achievements: gross and fine motor skills, language, sensory perception etc. Didactical aspects are represented mainly in the “prepared environment”. The educational interventions focus on the introduction of the use and purpose of the individual materials and are generally given to every single child separately. In the Children’s House, the unconscious, ‘absorbed’ impressions of the early childhood should be translated into conscious work by the child’s increasingly independent activity. The child should be enabled to expand its range of activity and should get used to extended social relations in the group (cf. Steenberg, Ulrich: Montessori-Pädagogik im Kindergarten, Freiburg 2007). The Children’s House and the school are closely connected with each other in an institutional context. In ideal circumstances (cf. the eight-year Basisschool in the Netherlands) there is a continuous educational career from the third to the twelfth year.